The Eagles don't usually take injured players on road games. They've made an exception this year. The coaching staff is trying to keep Jones as involved as possible this season while he recovers from a torn Achilles tendon suffered in March. He hasn't taken a snap for the Eagles in a game or even a practice, but they have made sure the second-round pick is like any other player in every other setting – whether it's in team meetings or on the team plane. "Hasn't missed one meeting. Hasn't missed a practice," defensive backs coach Cory Undlin said. "He's out there every single day. He's right next to us. He gets every call in every period. I call on him in the meetings as if he was playing. He knows the defense." It's still unknown when – or even if – Jones will play this season. Behind the scenes, the Eagles like what they see from Jones. The rookie cornerback remains a source of intrigue to Eagles fans eager to see the second-round pick. Owner Jeffrey Lurie said the Eagles believe Jones can be a "premier cornerback," which is why Lurie was on board with the strategy of selecting Jones and waiting until he's ready to play. There's no answer yet for when that will come. Jones, who's on the non-football injury list, can begin practicing at any point this season. Once he practices, the Eagles have 21 days to add him to the 53-man roster or place him on injured reserve. In previous years, the Eagles would have needed Jones to practice by Week 11, but the NFL eliminated that window while modifying a bylaw last offseason. The Eagles have emphasized patience. They have made no promises to play him this season, and Undlin made repeated references to this season or next season. The training staff will make that determination. Coach Doug Pederson said the Eagles must consider not only whether he's medically cleared to return, but whether he's in the physical condition needed to resume playing football. A league source told the Inquirer and Daily News last month that December might be a reasonable time to expect Jones to be fully functional. If that's the case, the Eagles could decide whether they want to hold Jones until 2018 or activate him for a postseason run. The Eagles' cornerbacks are playing better than expected, which offers reason to be patient. They have held their own with Jalen Mills, Patrick Robinson, and Rasul Douglas as the top three cornerbacks. 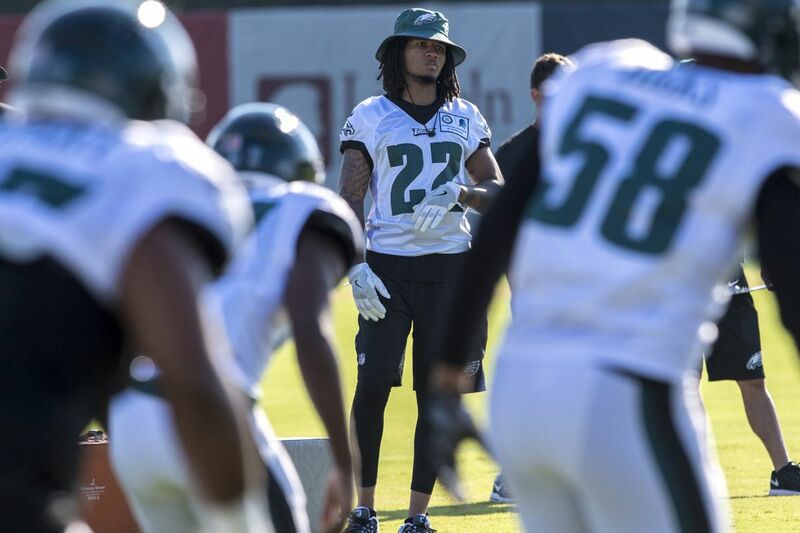 Ronald Darby, who was expected to be the No. 1 cornerback this season, should return from a dislocated ankle next week against Dallas. "Anytime you can be in like you're playing in the game – when the time comes, if it's this year, if it's next year, whenever it is – he's already been through the entire process," Undlin said. "Traveling. Being in the meetings in the hotels. …The more comfortable he gets in every situation he can be in, the better transition he gets for when he's ready to play." Undlin said the veterans in the defensive backfield also benefit Jones. Malcolm Jenkins, Rodney McLeod, Corey Graham, and Robinson are all experienced players and respected leaders. If Jones wants to learn how to prepare during the week, it's hard to find a better model than Jenkins. Defensive coordinator Jim Schwartz said during the summer that Jones can learn from the way Jenkins and McLeod respond to a bad day of practice. If Jones is going to be a premier player, then he'll need to find value in this time on the shelf. All of that helps, but only so much. When Undlin discussed Mills' improvement in his second season, Undlin emphasized that experience matters. The Eagles can't tout how beneficial it was for Mills to play as a rookie in one breath and also expect Jones to seamlessly overcome this extended absence. "It's a lot different in the meeting room when you're calling it out than if you're standing out there and you see shifts and motions," Undlin said. "We'll get to that point when we get to it. I don't know when that's going to be. But I've been very impressed with how he's approached it." The time will come. Whether it's in December 2017 or August 2018, Philadelphia will see Jones. When he arrives, can the Eagles' behind-the-scenes work make up for last time? "I can't answer that," Undlin said. "I won't know that until he's out there."